Within just 10 years, Circle Graphics, Inc., not only became the largest producer of digital large-format prints with almost one million orders delivered, but also earned an outstanding reputation for exceptional customer service that is backed by a 100% customer-satisfaction guarantee. The people at Circle Graphics then turned their attention to serving photographers and artists with equally high quality, fully finished canvas gallery wraps from a new division, CG Pro Prints. Its staff is just as dedicated to creating a superior product, with unique features the competitions’ products seldom offer and at a price point that also beats the competition. Not only do photographers and artists have an exceptional source for canvas gallery wraps, but also many opportunities to generate more revenue from a product that exceeds their customers’ expectations and creates more repeat business. 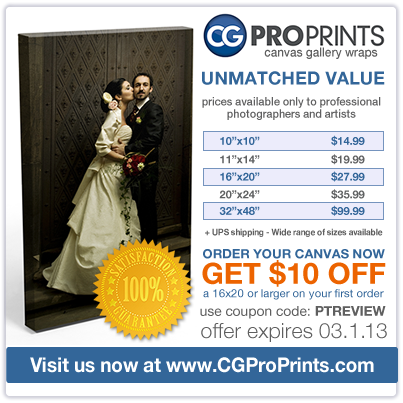 The value of CG Pro Prints canvas gallery wraps starts with how they are made. CG Pro Prints didn’t earn its reputation by using inferior materials for any of their products. The canvas gallery wraps are genuine artist canvas, so every one of them has the textural appeal and artisan quality to create a true masterpiece of your photographic images. A strong, durable backing isn’t a pay-extra option. Each frame is built with a solid face to support the canvas and keep it from deforming and loosening. Part of the company’s guarantee is that every canvas surface will remain tight and flat, looking as if it just left the assembly line. On a close inspection, you’ll find various attentions to detail that are sure signs that CG Pro Prints’ canvas gallery wraps actually enhance your professional reputation for offering your clients only the best. 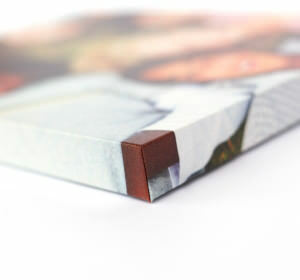 The corners can only be described as “perfect,” with no bulging and a finished back that is never stapled. CG Pro Prints’ canvas gallery wraps don’t require any of your valuable time to assemble or make ready for delivery. A tough, black backer board is always used and all hardware is pre-installed. Ship or hand it to your clients and they can hang it immediately. CG Pro Prints’ canvas gallery wraps will remain colorfully vibrant for years because only pigment-based inks are used. The color resolution and gamut is further enhanced with an 8-color ink set that gives every canvas a truly beautiful tonal quality. The people at CG Pro Prints don’t stop there. The final step is a clear acrylic coating, so the surface resists scratches and presents your clients’ portrait, wedding or other photos with a satin luster that immediately attracts all eyes when they enter the room. With all the care CG Pro Prints puts into its canvas gallery wraps and how well it treats its customers, it is no wonder many photographers have discovered new revenue streams with this product. One photographer recommends ordering a 16x 20 or 20x24 canvas of a wedding client’s favorite engagement image and giving it as a gift. Then, you can attach a business card and make sure it is prominently displayed on the gift table at the reception. Not only will guests be motivated to consider hiring a photographer that provides such a gift and a unique product, but also the wedding client is apt to order one or more images to be printed on canvas too. Another wedding photographer orders a canvas gallery wrap from CG Pro Prints of a wedding’s client image and gives it to the reception venue and/or the wedding planner. This allows them to show why the couple chose that venue or planner to promote their services to future wedding clients. Of course, the photographer’s name and logo are added to the print. A third photographer has a fine arts landscape business and offers striking canvas prints of her work to real estate agents and property managers to use for home staging, which increases the appeal of the properties for sale or rent. These and many other promotional ideas using CG Pro Prints’ canvas gallery wraps that are possible and affordable because a 10x10” canvas is only $12.99. Even a 16x20” at $22.99 or a 20x30” at $34.99 can easily be budgeted into every shoot to be given as a gift or hung in a photographer’s studio to attract interest from clients. You can learn more about CG Pro Prints and its canvas gallery wraps and what other photographers are saying about the quality of the product and the company’s customer service as well as placing your first order when you visit http://www.cgproprints.com.